With all the choices available for promoting our next event online, content marketing is still a successful strategy being utilized on the internet. Even better, user-generated content (UGC) has other people doing the work for us. How can we get users to make content for us or reuse their existing content? 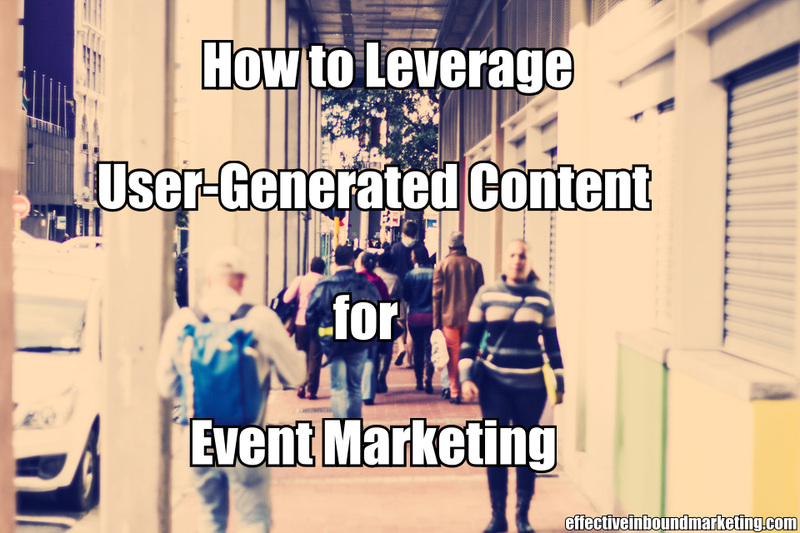 The more important question becomes, how can we effectively leverage this UGC to get more people to attend our event or conference? Especially if you have had similar events in the past, often people take and post photos from the conferences they have attended or put up other relevant information from their experience. Search for these past images and data by inserting your previous event title, date and location into a search engine and you use their UGC to promote your next red-letter date. Keep in mind that photos and other visuals will always get more attention than mere text. Promoting a creative contest can get both UGC and added recognition for your upcoming event. The key here is with creativity, since people will likely share (thus promoting) your contest if it is unique rather than a run-of-the-mill gift card giveaway. Perhaps you have a holiday theme for your event and you could have a photo-based “best decorated” tree or house contest and offer free attendance for the winner and their guest. To boost attendance, note that there will be a “live” vote at your event. Maybe you could purchase some useful branded swag and offer them to the top ten, well-written articles about your business or industry to be given away during at the conference. An effective way to reach a larger audience is to interact with them. Ask them questions, request their opinions and more. Reach out to them and they will likely respond. Post a short video about something relative to your business or industry and ask for others to do the same. Ask for opinions on what topic your audience would like to see at your event. What advice do they have to offer for your conference? Take a poll or a vote on what type presentation they would like to see (PowerPoint, SlideShare, PDF). Invite people to share their business triumphs and challenges. All the pertinent information (location, time, date, etc) about your event can accompany these posts. After your show is over, ask for comments and reviews. You can use these for your next event encouraging new attendees by showcasing the positive experiences from your former audience members. Sharing on social media for businesses attempting to use these platforms for marketing or promoting can be challenging. Often it is better to use a “back-door” type of approach rather than going after the “hard sale” and simply posting the details about your event. Before you begin advertising, start by interacting and engaging with your fellows online. Join industry relevant conversations at Google+ Hangouts. Write a helpful article on LinkedIn. Put up a pertinent post on Facebook. Hop aboard similar hashtag topics on Twitter. Once you have built up a rapport with your online audience, then you can start mentioning your event. If you come off as a friendly advisor rather than a pushy salesperson, you’ll see better attendance figures. Lately I received a few requests and even a few original articles from my readers, but only now I reazlize that I need to talk with them, and maybe accept their work to appear on my blog. I have visit your blog in which you have described about marketing. You know that before starting a business we make a plan for how we can become a successful business. Then for this, we need the help of other people and also need a traveling. So, I would recommend for best traveling you can visit here https://www.faremakers.com/flights/cheap-flights-from-lahore-to-dubai and reserve a Lahore to Dubai flights tickets according to your budget. Your own working hard is amazingly effective as well as When i get pleasure from somebody as well as hopping for a lot of further effective articles or blog posts. Click Here http://rentacarlahore.net and Get Rent a car in Lahore according to your affordable budget. Should You Take Guest Blogging Seriously in 2015?